Gaia GPS can accept GPX and KML files containing tracks, routes, and waypoints. Note: KML files can contain a large array of different types of data including maps. These types of KML files are not compatible with Gaia GPS. If you want to import a custom map source, read here. 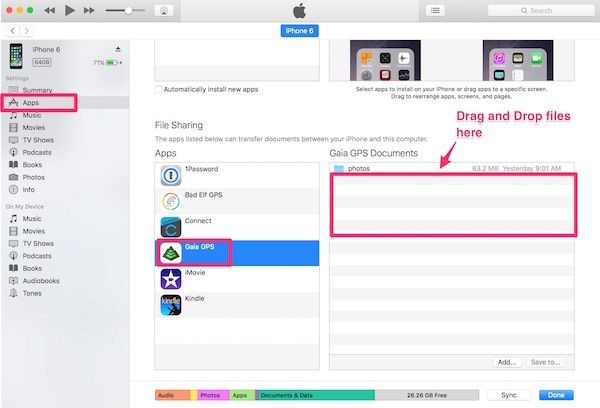 Long-press the attachment, and choose "Open In Gaia GPS" or "Copy to Gaia GPS"
Note: Every time you import a file into Gaia GPS, a new folder is created. Select "Copy to Gaia GPS"
1. 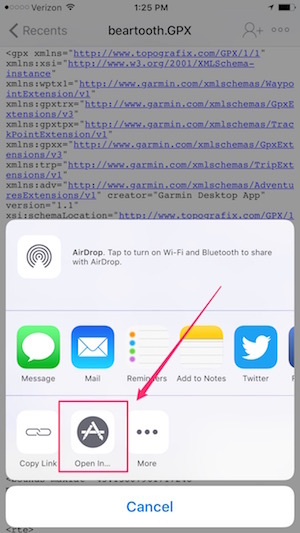 Add the GPX or KML file to your Dropbox account. 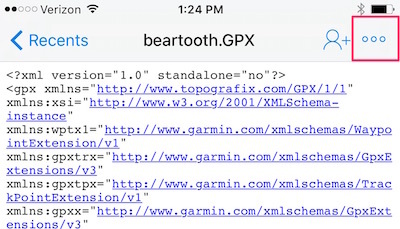 Gaia GPS has a file limit of 15 MB. Files over 15 MB should be split up into several files so that they can import into Gaia GPS. If you have both a GPX and KML with the same data, we recommend the GPX, as many KML files lack speed/time data contained in the GPX. I'm sorry you had trouble importing a GPX or KML file via email. Please contact support directly by clicking the 'Submit a Request' button above and we can take a closer look at what you are experiencing. I don't have the option to "Copy to" or "Save to" "Gaia GPS". I don't have an "Import GPX" feature. I'm sorry you are having an issue importing data into Gaia GPS. It looks like you are working with Robyn to troubleshoot this issue. Can you send a copy of the GPX file via email if you are still experiencing issues importing directly into the app. I cannot download GPX files because the device does not show the option to "copy to Gaia GPS". How do I add that option? I'm sorry for the trouble - I believe I'm working with you via email with steps on how to fix this issue. Please send me an email if you are still having trouble. I'm struggling with uploading GPX files into Gaia. I've tried the Dropbox method, Mail method, and the iTunes method - none of which work. For the Dropbox and Mail methods, there is no "copy to Gaia GPS" option anywhere. For the iTunes method, I am able to copy the files to Gaia within iTunes on my Mac, but I'm not able to actually pull them up (nor do I get the "import" messaging) within the Gaia iOS app. Please help! You have to use the iOS Mail application NOT Gmail or Yahoo app. Mail Cannot be open on any other devices also This will give the save option. @rylandpercy if you are still having trouble importing the file, please send a copy of it to support@gaiagps.com and we can definitely help.